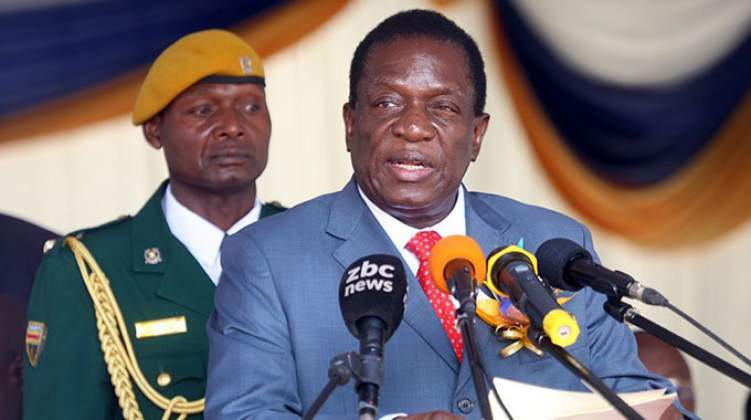 President Mnangagwa yesterday said the Intermediary Money Transfer Tax of 2 cents will remain in force as it is critical in transforming the economy, which has suffered from two decades of stagnation. The President said the tax was not designed to hurt ordinary people and companies, but to help the manufacturing sector get funds for retooling and modernisation as the economy gears to ramp up production. However, there is room for the tax to be refined going forward if suggestions are proffered, to create a win-win situation for individuals and companies on one hand, and the economy on the other. President Mnangagwa said this while fielding questions from delegates during the Professional Women, Women Executives and Business Women's Forum (Proweb) breakfast meeting in Harare yesterday. British American Tobacco (BAT) Zimbabwe managing director Ms Clara Mlambo had indicated that the tax was choking companies and affecting consumers' disposable incomes. "I am sure you have not studied who are exempt from that tax. If you had taken care to study the exemptions of the 2 percent (tax), some of the issues you have raised, you would not have raised because they are already exempt. "The transfers between companies, company-to-company, salaries, employment transactions and so on . . . there is a list of such exemptions that are there," responded President Mnangagwa. Last Friday, Finance and Economic Development Minister Professor Mthuli Ncube announced upper and lower limits for the Intermediary Money Transfer Tax. Prof Ncube said transactions below $10 will no longer attract the 2 cents tax, while all transactions between $10 and $500 000 will comply with the new tax regime. Further, the new tax, which will be gazetted "soon", will not apply to eight other types of transactions which are; inter-company transfer of funds, including transfers of intermediary accounts; transfer of funds on sale and purchase of equities; transfer of funds on purchase and redemption of money market instruments; transfer of funds for payment of salaries; and for payment of taxes. "We have taken cognisance of not punishing our people unnecessarily. But it is necessary, if you look at the challenges we have now, both of the issue of internal debt and external debt. "Where we stand today as Zimbabwe, for us to become a viable economy, a solid economy, we are going to take measures that are going to be painful. And this is one of such measures." The country's internal debt is $9,5 billion as at August this year, up from $275,8 million in 2012 while the external debt is $7,4 billion. The total debt is $16,9 billion. Prof Ncube is currently in Bali, Indonesia where he is engaging some of the external creditors including the World Bank, the International Monetary Fund (IMF), African Development Bank (AfDB) and the Paris Club, among others. "I have no doubt as you say possibly, it (the tax) could have been better but at this time, we have begun what we have done (and) as we go on, as we dialogue; we are likely to improve on what we are doing but there is always the beginning, and this is the beginning. "And it is good that we are now receiving reactions, responses, some positive (and) some negative like yourselves on this issue, but as we go forward, we must strike the balance between what is good for us again to support the public sector in order to have a huge percentage of the budget being applied to capital expenditure than social expenditure. "This is what is there. We will not please the taxpayer, no, we want to please the economy of the country, not the individual. The individual, myself, yourself must make sure that we produce and produce and produce. "We need productivity, productivity, for us to earn the foreign currency which can use to modernise and retool both industry and commerce. It will not come from anywhere but from productivity," said President Mnangagwa. "Yes we may differ on how the journey must be walked but we must begin walking, as we walk the journey, the genuine and patriotic Zimbabweans will come and say we should do it this way, why don't we do it this way, and we are listening leadership. "We will always take on board those contributions that we think are constructive and progressive for purposes of again, having a solid economy of our country. "We want to please the economy, not individuals. Individuals must produce so that we can earn foreign currency to modernise and retool our industries," said President Mnangagwa. He said the liberalisation of the economy has its own pains and the tax was one of the pains that companies and individuals should be prepared to go through. The President also said the country will not continue to live in the past when the world is going ahead with ICTs in terms of revenue collection. "The traditional methods of revenue collection are changing by the day. The world is migrating from the past to the modern ICTs and as Zimbabwe we must follow and adapt ourselves to modern trends of revenue collection," he said. "Last week, Minister of Finance Mthuli Ncube, drawing on his vast experience as chief economist and vice president at the African Development Bank (AfDB), announced a series of measures to reform and revive our economy, and put us on the path to steady economic growth. Cognisant of the scale and urgency of the challenges facing us, our plan is bold and far reaching, and will have the desired effect. I have read your comments and understand the difficulties many face, and Government will do all in its power to minimise them. We are already taking the lead by cutting back on unnecessary spending. The only way to a stronger economy is to restructure, rebuild and reform," he said. Added President Mnangagwa: "We must all be realistic. Whatever some may claim, there are no silver bullets or quick fixes. There is no need to panic, and Government is guaranteeing the availability of all essential commodities, including fuel. We are on a shared journey to a better and more secure future. The road is long, winding and at times bumpy, but there is no other way. This is the road to a middle-income economy, and if we travel it together, with patience and purpose, we will realise our vision."